Amplitude Studios have a strange story, all things considered. It started as a way for experienced people to go small and leave the creative limitations of AAA publishers. They self-funded Endless Space, a great 4X space game. This did well enough for them to release two more games set in the same universe; Endless Legend and Dungeon of the Endless. Just a few months ago, they found themselves back as AAA when SEGA bought them. SEGA’s aim is clearly to further expand their reach into the PC market and strategy genre. Thankfully, this doesn’t seem to have impacted on Endless Space 2. Something that could be Amplitude’s best game yet. From the very start Amplitude have actively used their own creation, Games2gether, to include fans of their games to get involved in development through votes, contests and more. These contests include designing ships, quests and even factions that appear in the finished game. Rewards ranging from free copies of the game, T-shirts and badges for the forums, to a spot in the game’s credits or a trip to their studio in Paris. SEGA have let this continue and I can’t imagine them stopping as they have been studio friendly when it comes to creativity and management, at least by looking at the freedom Sports Interactive, Creative Assembly and Relic Entertainment have. But you’re here to learn more about Endless Space 2, what I learned at Gamescom and later. Not my thoughts on the studio and its acquisition by Sega. There’s a lot to look at as Endless Space 2 is already showing a larger scope than the original managed. This is also while staying true to the roots that made all three of their current games successful, as well as fan favorites. What this also means is that we know that Endless Space is coming to Early Access as their other games have done. It’s also been revealed that we’ll be getting it this September. The early access will feature four of the eventual eight factions. One of the final factions, pacifist diplomats, will actually be designed by the community using Games2gether. Of the four factions to be released with the early access we already know of three. Two of them are the Sophon and Craver factions, which are returning from Endless Space. In addition to this is a brand new faction called the Lumeris, an aquatic species that rapidly expanded thanks to the discovery of Dust. Dust, if you’re not familiar with the Endless games, is a magical space material that can become whatever you want. 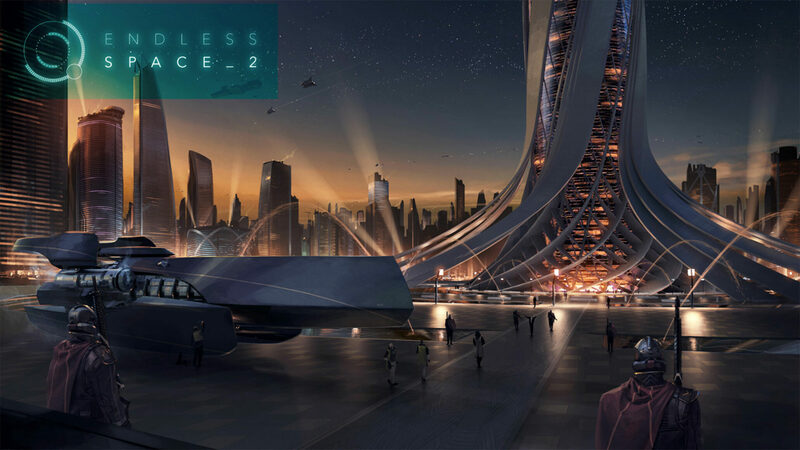 Endless Space 2 looks to have expanded a considerable amount from its previous outing. This is through building upon aspects found in other games, as well as expanding on current, or adding in completely new features. Where this is particularly noticeable is in the inclusion of specific race storylines and quests. The Lumeris you can see a little about in the above video. The Sophons, here, are in a battle with a rogue super-AI that they created. These faction quests offer multiple choices and these choices will impact your population, their happiness and more. Also borrowed from Endless Legend is the inclusion of an overarching separate narrative, though on a larger scope. More than simply focusing on the death of one planet (Auriga in Endless Legend) there is something here that is on a universal scope. The developer from Amplitude wasn’t able to go into further than that, but it’s still intriguing. Where Endless Space 2 looks to have expanded the most is in politics and diplomacy. In the first game politics was fairly simple and flat. You had an approval rating, if it was high, the people were productive. Here, you have multiple political factions to deal with. You also have to consider how your decisions in quests, as well as events that simply happen through general play, will change people’s thoughts. You explore from your system to find that the warmongering Craver are nearby, there’s a chance that any aggressive faction in your nation will grow. Selecting a faction to support will determine so much of what you can even do within the game. For example, if your senate is mostly composed of pacifists, then you are going to find it incredibly difficult to gather support for aggressive options, such as declaring war on an enemy. 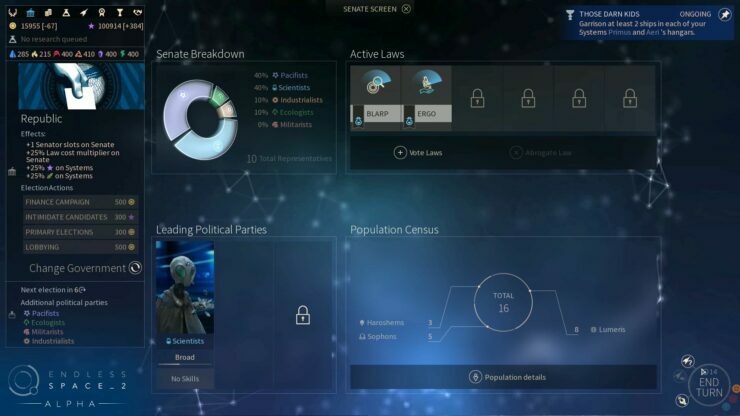 In addition, the composition of your senate will affect what general laws you can enact, which can do anything from increasing production or ship damage, to expanding the population growth of your empire. This would be enough of an upgrade in most cases, but not for Endless Space 2. Amplitude have expanded both the exploration and military aspects of the game. In addition, they’ve made it such a visually splendid thing to behold. There are ship battles, which are in full 3D with excellently designed ships, against stunning backdrops. Colorful and sleek menu’s that are informative and pleasant on the eyes. Most of all is the new ‘Amplified Vision‘ system: this lets players like myself, who are interested in seeing further details and the behind-the-scenes links within the world, view so much more. The linked image just shows one of the number of views that Amplified Vision has to offer. Where this will work with best is in the new exploration system on offer. Although it’ll seem like a small addition, it’s surprising how much of an impact it can have. Once you’ve researched enough, you’ll be able to manufacture probes that you can send off to explore the galaxy. Point them in a direction and they will move forward, turn by turn, revealing more to you without putting any of your forces at risk. Probes will also be used for exploring a new planet, reminiscent of the way they were used in Mass Effect 2. Rather than landing on a planet to find out what, exactly, it had to offer, now you will send probes and learn what surprises the planet contains before colonizing it. Growing from the Disharmony DLC for Endless Space, ships have more customization than they had in the previous game. Amplitude have developed in a way that also looks easy to use and adapt to. 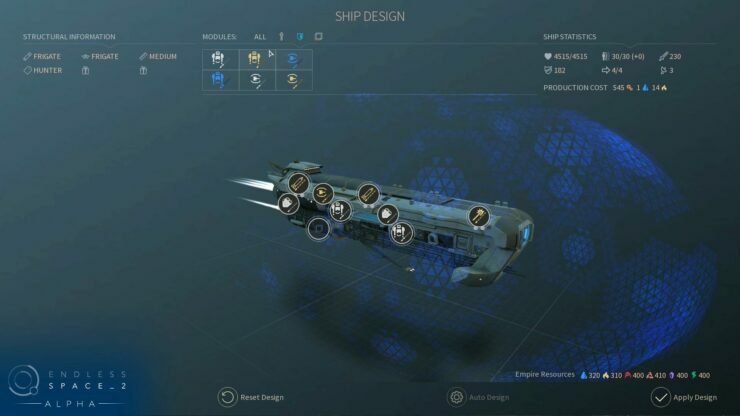 You effectively create your own ships, adapting them using the tech you’ve researched. This lets you make your own variations, leaving you with fleets that genuinely make you feel like they’re your own. This will be particularly good when you see your ships in battle. Prior to these battles there is a new opening tactical system, where you pick a plan for the AI to follow. It also shows you, based on your intelligence of the opponent, what you believe their plan of attack to be. It’s an absolutely great sign that Amplitude have got so much to show already. Endless space hasn’t even entered Early Access, so for everything to be so solid already makes me very happy. The 4X genre has made a resurgence over the past five or so years and Endless Space 2 looks to be building on this. I own every game by Amplitude and this isn’t going to be an exception to that rule. A fitting sequel to Endless Space, this is a game that you should be watching. In the meantime, you can read our previous interview with Creative Director Romain de Waubert de Genlis if you haven’t already.